The suspension will cost Suh $164,000 in lost pay, and the way the official announcement reads, the mere filing of an appeal will not allow him to play in Sunday night’s game against New Orleans, a game in which his teammates will miss him sorely; only a completely successful appeal could do that. In addition to the team and individual character costs of mounting sanctions, some have begun to speculate that Suh’s corporate endorsers may not like his image either, although none have signaled any changes. Since everybody saw him for the first time in the Big XII title game against Texas his senior year, for the second time as the first defensive tackle invited to the Heisman ceremonies in fifteen years, and for the third time as the number two overall pick in the NFL draft, Suh has been understood as a transcendent player. The spotlight rarely shines on the D-line, but it shines on Suh because of his amazing abilities. Add to that intelligence and composure in front of cameras and microphones, and it’s easy to understand why Suh became, more than even Matthew Stafford and– inexplicably– Calvin Johnson, the face of the new, successful (not dirty) Detroit Lions. And it was somehow fitting that a defensive tackle would be the face of a resurgent Detroit team, but now we’re wandering down that (paved) path of the Motor City’s inferiority/superiority complex. Everybody in Detroit loved him because of his attitude, abilities, and affability, and when he found himself in trouble, I explained it as him being so good, big, and strong, that he was out of context. Like a kid who has his growth spurt at age two, it looks like he’s playing rough with his peers, when he really isn’t; he’s just bigger and stronger than them. Just as the manchild (mannish boy? (keep reading)) draws the attention and ire of playtime monitors, so too does an athlete like Suh draw the attention and ire of the NFL’s player monitors. In this telling, there’s no bad intent, which is what so many NFL penalties seem to be about. 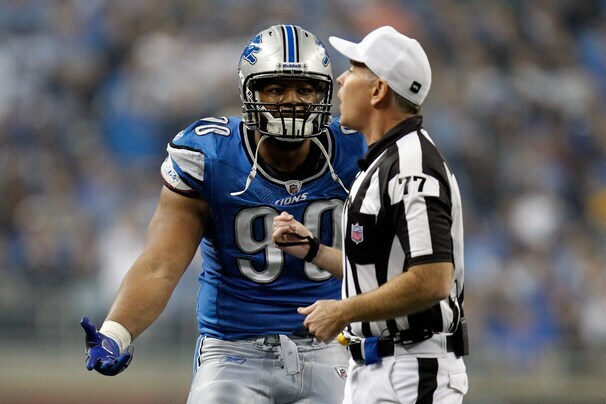 Intent is too hard to ferret out in sports, however; instead, we must judge the act qua act and its result, and Suh’s acts were causing some violent results. That’s still as far as I’ve gotten. I don’t know whether a two-game suspension is fair. It doesn’t seem unfair. I do know that the Lions need him in games to win and they can’t have him taking fifteen yarders and getting ejected. It has crossed the line from “you’re not helpin’ ’em” to “you’re hurtin’ ’em,” and that’s the time when a guy needs to take a break and figure things out. Since when did prisoners get to wear sunglasses? Anyway, after listening again, I remember what Sue’s lesson for Suh was, but I suppose you get it now too. I’ll just leave it at this: looking forward to having you back, Ndamukong. This entry was posted in ALDLAND and tagged big 12, detroit, jim rome, johnny cash, lions, muddy waters, music, ndamukong suh, nebraska, nfl by AD. Bookmark the permalink. Kristi Dosh (@SportsBizMiss and now of ESPN) reports that Suh need not be worried about any threats to his personal endoresment deals at this time: http://espn.go.com/blog/sportsbusiness/post/_/id/137/suh-actions-unlikely-to-hurt-endorsements.